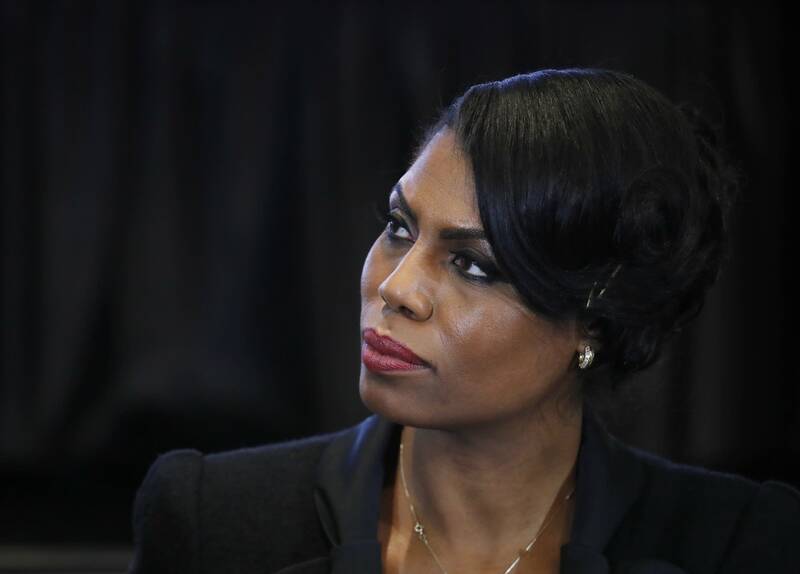 Former White House aide Omarosa Manigault Newman declared that she "will not be silenced" by President Trump, remaining defiant as her public feud with her former boss appeared to shift to a possible legal battle. In an interview Tuesday with The Associated Press, Manigault Newman, who is promoting her new book about her time in Trump's orbit, said she believes the president's campaign is trying to keep her from telling her story. She commented just hours after Trump's campaign announced it was filing an arbitration action against her, alleging violations of a secrecy agreement she signed. "I will not be intimidated," she told the AP. "I'm not going to be bullied by Donald Trump." Still, the former reality TV star-turned-political aide declined to answer several questions about her experiences during her year as the highest-ranking African-American aide in Trump's White House, citing the arbitration action. She said she'd been interviewed by special counsel Robert Mueller's office, but would not discuss details. But Manigault Newman insisted she pushed for diversity at the White House, which currently has no African-American in a senior role following her departure. Manigault Newman continued to unleash scathing criticism of the 72-year-old Trump, saying he's in mental decline and unfit to be president, and is intentionally sowing racial division. She accused him of using his rowdy political rallies to divide, even suggesting Trump is promoting violence. Discussing the differences between their views, she said: "One, I want to see this nation united as opposed to divided. I don't want to see a race war as Donald Trump does." The White House counters that Manigault Newman is a disgruntled former staffer with credibility and character issues who is now trying to profit through false attacks against someone she has worked with and supported for more than a decade, including his presidential campaign. "She worked here for a year and didn't have any of these things to say," White House press secretary Sarah Huckabee Sanders told reporters in Washington. "In fact, everything she said was quite the opposite. And not just the year that she worked here, but the time that she spent on the campaign trail and I think it's really sad what she's doing at this point." Manigault Newman, who has known Trump since she was a contestant in 2003 on his reality TV show, "The Apprentice," said his proclivity for racial division is evident "when you see at every single opportunity he insults African-Americans." She noted, as examples, Trump's recent criticism of NBA player LeBron James and California Democratic Rep. Maxine Waters. Trump recently tweeted that it took the "dumbest man on television" — also an African-American — to make James "look smart," and he regularly refers to Waters as "low I.Q." "He wants to divide this nation," said Manigault Newman, who spoke to the AP during the publicity tour for her book, "Unhinged," in which she portrays Trump as racist and misogynistic. "He wants to pit his base against successful African-Americans," she said. "He uses his rallies to really encourage people to bring down African-Americans. That is truly evidence that this man is not trying to unite us. But he is specifically trying to divide us." In addition to speaking publicly about her experiences in Trump's White House, Manigault Newman has been releasing audio recordings of conversations and meetings held in the building, including a snippet of one she says is of her telephone conversation with Trump the day after she was fired in December by White House chief of staff John Kelly. She declined Tuesday to answer questions about her recordings, which she has described as a "treasure trove," and the extent to which colleagues are secretly recording each other at the White House, again citing the arbitration action. But she defended herself against criticism that she didn't do enough to help African-Americans. She noted that hiring and personnel were the responsibility of others in the White House, but said she has "tons and tons of emails" in which she pushed job candidates for consideration. "And it just didn't seem good enough for this White House," Manigault Newman said, suggesting the president is uninterested having a diverse staff. "There is no excuse that there's not another African-American assistant to the president. No excuse whatsoever." She talked about helping secure funding for the nation's historically black colleges and universities, of which she is a graduate.